We provide several "modules" (services) to create Android apps without coding, just scroll down a little bit to check them! With Kodular Creator, you can start creating incredible apps without any coding knowledge! If you are an advanced user, why not code in Java and create amazing Extensions for the Creator? 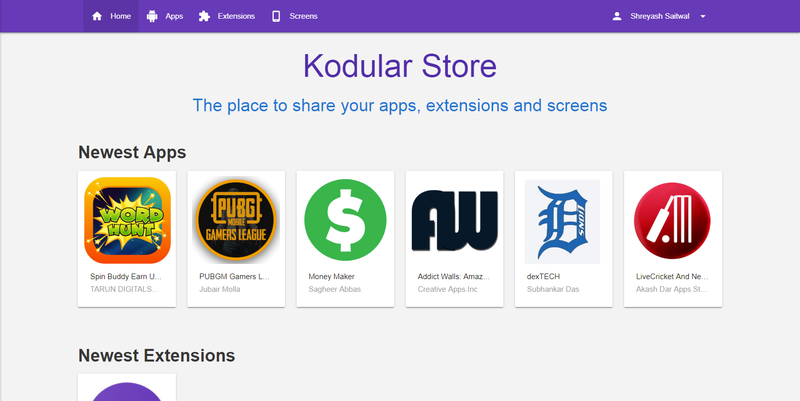 Share your apps, projects, extensions and screens in this free Store developed by Kodular Team! If you are unable to use Kodular, you can check if there's any problem with our servers. Why not take a look at our amazing community? Our users are just amazing, and thanks to them our community is a really nice place to share your doubts, projects or suggestions releated with Kodular. Our Team is very enthusiastic and loves helping people. They will really like to help you on the road to create an app. We are devotees of the IT! Kodular Infrastructure is powered by our partner ArubaCloud, which guarantees a really good uptime and performance. Read what our users say about Kodular. I'm impressed with the beautiful Material Design UI. Also the fact that the team listens to their customers is my most favorite fact about Kodular. I have always been crazy on technology and making mobile apps. Kodular helps me to make the most professional apps. I am really impressed by the way Kodular evolves into the most professional of all the available App Inventor clones around. Kodular is merging the ability to create awesome Android apps without writing a single line of code and the ability to make an app in a stunning way. The first time I tried Kodular, I was impressed with the number of components that it had. It’s also very easy to learn, even for most beginners. Kodular is hands down the fastest way to make an app, and lets me make production-ready apps directly on my Android tablet. With Kodular it's easier to make my apps for the number of options offered to the development, all very intuitive and you get help from the community. Kodular, a free platform to let your ideas become Android apps. Simple, beautiful and powerful. Kodular is the best way to make apps with a simple interface and simple code! There are so many components and options, and it has a beautiful Material Design. What I love the most about Kodular is its stunning and fabulous user interface. It also provides a number of components with block based programming which makes app building as easy as applying butter on the bread! Kodular provides a simple interface with lots of components. Thanks to this, you can create the best apps for anyone. So, start where you are, use Kodular and make everything you want! I am greatly surprised to see the level where Kodular has reached and I'm sure this is only the beginning of a GREAT tool. When users start creating such useful and well-designed apps like Koders do, you really should think that you have done something good.